Blogging for over ten years, one of my biggest identities as a grown up has been that I am a blogger, the creator of this blog, writing up and sharing new inspiration every week… But if we lose that ability to write and share blog posts – how do we go about finding the Invincible-blogger-self again? I am the Invincible blogger. I might not post very often right now, but I am not giving up this thing called blogging. Not this year, and not next year either. Or at least that is my plan, so I keep coming back – and then loosing it. My voice. The momentum. The identity as a blogger. Maybe I’m not the only one? One of my biggest identities as a grown up has been that I am a blogger on this journey to share stuff with you guys for the long haul. But this year I haven’t as much, and that makes me sad and a bit stressed out. I feel like I have, in a way, lost my identity as a blogger. But is not true, because as long as I am alive and trying, this will be alive too. Oh, wanna know the secret trick right now? It is the simple truth of: Just start and then continue, as with writing and blogging as well as how to become more creative in anything. The blogger gurus is all giving the same blogging advice, and it is about brainstorming: listing and jotting down a lot of ideas at once so that you have a back log/bank of blogging ideas to use from day to day. As if the problem would be that there one day wouldn’t be any ideas in your head. Or that the problem of writing would be solved with a list of ideas… I find it is more difficult than that. Because oh man, do I have ideas. I have more than enough ideas of what to write about! The question: “What to write today?” is something that has not yet come up for me. Ever. My problem is usually that I have way way too many ideas in my head. There is not enough room for them all. I always ask myself: how to get them all out at once (wish I could, oh how I wish I could). They seam too many to even make a comprehensive list of, at least if I don’t divide the ideas into categories to make it manageable. And my categories are not all about writing either… I’ve got huge lists on what I want to create in many different areas: Books I want to bind, knits I want to finish, embroideries I want to start, art journal projects I want to dive into, collage art I want to create, classes I want to teach – and so on. I totally understand why some people give the advice that you as a creative person/artist should concentrate on ONE thing at a time. At times I have tried that approach, but it doesn’t really work that great for me. I need to mix things up, daily. An ideal day for me would include photography, photo editing, writing, painting or doing collage, sewing and then some reading to finish things of. But the hours of the day does not accommodate that, especially as I know I should also add in exercise, going outside, meditation, cooking, socializing – and cleaning! On my wish list for Christmas, as it is every year, is more energy hours of the day. But back to blogging for now. It’s why you’re here after all. To get some content, some inspiration, some ideas. Creating a successful blog is a journey, and no matter what you do, it won’t be perfect. So just let go of thinking it will be, and write anyway. …blogging consistently is more than just quantity, it’s also about quality. Find that sweet spot that works for you, ask yourself, how many times per week can you write a quality blog post? Once? Twice? Maybe three times per week? Or maybe you’re a blogging maven and can write five quality blog posts per week? Whatever the answer – stick to that. My biggest problem as a writer/blogger is this: the more time that passes where I’m not writing, the harder it gets coming back to writing. It just feels too big, too wild, and too much. The back log of ideas, that has not been blogged about, is ginormous. I know I am the only one who knows about the “missing content”, because it’s only in my head, but it feels like a problem that it’s not here. All the things I haven’t yet shared becomes obstacles of what to share next. So maybe the planning it out better is something I should try, even though I find it hard? I am printing a calendar overview of the last two months of the year right now, and committing to at least THREE blog posts each week until the end of the year. I know I want to share a lot more than that, but hey, let’s take it slow, shall we? Who is with me? Thanks Christy for the idea of the title of this post, and for the encouragement. She also suggests taking notes, reading others blogs, creating a mindmap and other fun activities. But since I have loads of ideas, I am only linking to that one for your sake, in case you need idea generating help. I know I am Invincible when it comes to blogging, because I am here – ain’t I? Boring rut indeed! 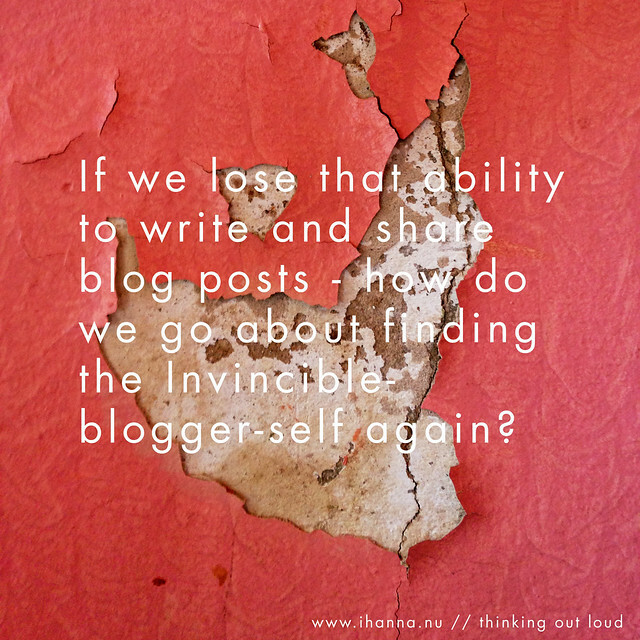 If you are finding the Invincible-blogger-self missing, I suggest you decide on sharing just one blog post this week, about anything that makes you happy – and then go from there! That’s what I plan on doing. And if you’re not a blogger, maybe encourage a blogger you love? That helps a lot too. I would love to know your thoughts on the trend of blogs dying, writing ruts, and the scope of this post in general. Chim in. Tomorrows blog post: sharing pretty things on my desk. Yay! This entry was posted in Creative habits, On writing and tagged blog love, blogging, goalsetting, not writing. Bookmark the permalink. Great post Hanna. Gosh I could almost have written this myself… not so much about lapsing, but having so many ideas in my head that I end up overwhelmed and not sure what to write about. Because also like you, I also am passionate about so many things. I am currently doing a 30 day Blogging Challenge which is really exhausting, in the amount of hours I spend each day, but tomorrow is day 28 and I have not missed yet! Rather than run out of ideas more just keep coming and coming! I started the challenge because I wanted to become more knowledgeable and to find ways of being more efficient. It has been an amazing challenge, run by Sarah Arrow and I recommend it. It is free by the way! I started it because a friend and I noticed that less people are commenting on our posts, and like you I have noticed some people are posting less often or not at all. It’s good to have a brief pause to catch your breath sometimes and reflect. I plan to do that when this 30 day challenge is over. I have a list of things I want to practice and perfect as my blog is lover overdue a tidy and update. I look forward to seeing more posts and it’s reassuring that everyone flounders now and then. It’s a sign of being human! Thank you Sandie, and a big congratulations for blogging for 30 days straight! That is just an awesome achievement. And such a challenge I would be afraid to take on, because anything “must do daily” that is that big is difficult for me. But maybe I should try it sometime next year – Just to see if I could pull it off… :-) Not making any promises! Hi Hanna, Your blog is one that I get through RSS feed and the updated posts show up on my “dashboard.” Every evening I look forward to the new posts on the various blogs and have read many of them for years. It never occurred to me until just recently that it is important for the people who write the blogs to receive comments from the people who read them! Please bear with me, as this is one of the few comments I’ve written but it is kind of long! I have noticed that new posts are less frequent than in years past, and some blogs aren’t updated anymore at all. I agree that all the social media platforms make it overwhelming for both for the readers and the writers, but I think that people who are really interested in something will stick with it. I used to be a Creative Memories consultant (a scrapbooking company) back in 1997, before digital photography and cell phones became so popular. Only a few years after I started, scrapbooking supplies became available everywhere and Creative Memories lost it’s novelty and eventually went out of business. But in spite of all the changes in society, those who were interested in traditional scrapbooking (not digital) stuck with it and Creative Memories is back in business again. So all that to say….in my opinion everything goes through “seasons” or “cycles” and I think those who choose to continue write blogs will find their way through the ups and downs and changes and those who choose to read them will also continue to do so. So if you write it, I’ll read it and try to comment now and then, too. :-) Best wishes to you! Your creativity is inspiring! Great post….. Thanks for sharing so much of yourself. I also follow you in a reader so I don’t miss any posts. As with everything, I think blogging is going through some changes. I’m not sure about the tips from Fran of the Freeborboleta blog…. Seems to me that putting stress on ones’ self to always write a “quality” post would be overwhelming. As a blog reader, I prefer to see the real person behind the content… not perfection. Do what feels right for you… be true to yourself… that’s when your post SHINE the most. We love you Hanna and always love your posts. I too know what you mean about ending up overwhelmed because I suffer from paralysis when doing things [not blogging but other things] because I have too many ideas and no idea where to start and so, I don’t [except for gathering even more ideas!] It can be frustrating, for sure. Well, yes, hmm, I recognise a lot of similar thoughts in your post Hanna. I had a 4 month haitus, that I was travelling for a major part of it is not really a particularly good reason. The fact is, I simply decided not to blog for a while. I find when I place demands around frequency of posts (or doing anything else to a schedule) I get this little rebellion going on inside me and I’m more likely to resist because it feels like being back at work where my time was scheduled and regulated by bells, and it’s not the kind of work I want to do so I tend to post when I feel like it. If it’s not a pleasure I won’t do it. If I don’t have something current to say or show I don’t do it. I have little interest in how many visitors I have although comments and ‘likes’ are most welcome and, like you, I always respond . . . in fact rarely leave a response on a blog where there is never a response. I guess the need to blog regularly hinges on why you do it and what you hope to get out of it. If I can encourage one person to follow their creative urges, to learn to play again after years of having to please and work for others, be a little selfish if you will, then I’ve succeeded. i can relate to all of this dear Hanna. I love your blog and open it daily in the hope to find a new post. I loved the time when you showed your mail art daily ; I just love your collages. What I look for in the blogs I like is that kind of eye candy and some explanations about how they created it…it may be a give away but not every technique has to be taught in an online course. The way I blog is like that: I want to explain why and how I made things. I just blog when I have news things to show and that it often enough. I blog like I write in a journal; in fact I don’t write in my journals as much as I used to because now I blog. It helps me to keep grip on the world around me. sometimes it’s enough to just show one picture, a photo or a small collage so that your readers know you are there and concocting bigger things. What struck me most in your blog is how you said you just can’t focus on one thing at a time….it is so me as well! And if it feels sometimes like your brain is broken, then well just have a peek at my blog where i tell how, with belief in yourself and interest in many things and a sense of humour, the brain heals! I love your ideal day – that sounds fun to me too. Its easy to get overwhelmed by all the social media platforms that we’re supposed to be contributing to in addition to blogging. There’s only so much time in a day so I just pick three to focus on and let the rest go. Otherwise I don’t have time for creating and then I have nothing to post about. I also feel its OK to take a break now and then to recharge or try something new. Maybe you could combine your favorite blogging topics into something new like collaging photographs or sewing hand-painted canvas into little bags. Good luck restarting your blogging mojo.